You can provide your infant with the healthiest and safest start in life by doing a number of things. One of them is giving your baby a probiotic supplement to make sure her or his gut flora is balanced. In today’s article, I have listed and detailed 6 of the most popular and effective baby probiotics available out there. Make sure you choose wisely. *The following probiotic supplements are listed in no particular order. However, I have chosen them based on their level of efficacy, ingredients, active bacteria strains content, and consumer reviews. This is a gentle yet powerful probiotic blend that will help your baby’s digestive system. The formula is free of D-Lactate. GutPRO doesn’t contain potentially-allergenic compounds such as dairy and gluten. The formulation was specially created to meet the needs of an infant’s developing gut. 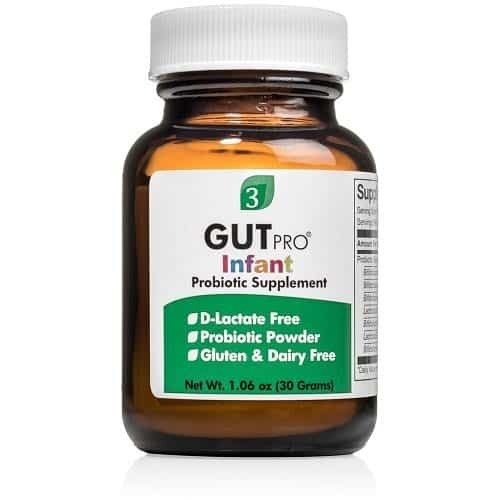 The GutPRO probiotic powder for infants is sold for the price of $99.95 (one container of 30 grams). This infant probiotic has a great taste, and it is dairy-free. Moreover, the ProBiota Infant Powder absorbs quickly and contains ingredients that infants need in order to fight harmful gut bacteria. ProBiota also promotes a healthy immunity development for babies under the age of 2 years old. Bifidobacterium strains – infantis, breve, bifidum, lactis, longum. This supplement is one of the best baby probiotics on the market. The suggested dosage is one scoop given to your child, once or twice per day (for children who are at least one year old). For babies between 6 and 12 months old, the right dosage is one single scoop per day. There are no other ingredients in this supplement. You must be careful where you’re purchasing this product from. The reason I am saying that is that Ther-Biotic must always come with an ice pack because it requires refrigeration. One bottle of Ther-Biotic for Infants that measures 66 grams is marketed for the price of $34.38. Check out the latest prices on Amazon. This probiotic comes in the form of liquid drops, has a grape flavor, and it is good for both infants and kids. The Children’s Probonix is a highly convenient product because it doesn’t require refrigeration. You can give it to your baby as it is by placing the right dosage on the infant’s tongue or by combining it with another liquid. You can purchase a one-month supply of Probonix Daily Probiotic on Amazon, for the price of $31.29. Check out the latest prices on Amazon. This product alleviates symptoms of gassiness by breaking up the gas bubbles that might form in your infant’s gut. These problems can be caused by certain baby formulas or by air swallowing. Before giving the Infant’s Mylicon Drops to your baby, you should shake the bottle very well. It is best to use it after a meal or even before bedtime. From all the baby probiotics I’ve included on my list, Mylicon drops supplement is the most affordable product. One container of 0.28 fluid ounces can be bought for $21.99. Check out the latest prices on Amazon. This probiotic is working equally effective for both babies and bigger children. The formula is based on whole foods, and it comes with three important probiotic strains, besides 6 additional ones of Bifidobacterium and Lactobacillus. Probiotic blend – Lactobacillus casei, Bifidobacterium bifidum, Bifidobacterium infantis, Lactobacillus paracasei, etc. If you’re interested in buying the WellBelly probiotic supplement, you will find it on Amazon. One jar of 60 servings costs $31.99. Check out the latest prices on Amazon. I hope my recommendations will help you find the best probiotic supplement for your little one. Being mindful of your infant’s gastrointestinal health will provide him or her with the most essential gift that will benefit the baby in the future as well. Feel free to share with us the baby probiotic you have been using and tell us how well it has worked for your newborn.